Democratic Texas Senate candidate Beto O'Rourke played "coy" when asked by a BBC reporter if he supported common ownership of the means of production, a common definition for socialism. BBC News reporter James Cook wrote a profile of O'Rourke—the sheer amount of profiles on O'Rourke has even been lampooned by The Onion—and noted Sen. Ted Cruz (R., Texas) has cast his election fight with him as a battle "between socialism and the American free enterprise system." When I point out to Mr Cruz that his opponent hasn't actually advocated state ownership of the means of production – a widely accepted definition of socialism – the senator shoots back "he supports socialised medicine". The senator adds that "as Margaret Thatcher said, the problem with socialism is eventually you run out of other people's money". Yet, Cook admitted a paragraph later that O'Rourke wouldn't disavow socialism as he defined it, instead, saying, "the party labels just do not matter anymore. I'm convinced of it. It's not Republican or Democrat. It's Texan and American and that's what we're standing for in this campaign:"
Intriguingly when I ask Mr O'Rourke the same question – do you support common ownership of the means of production, he is coy. It is hard to think of another mainstream US politician who would answer with anything other than the word "no". But even given several chances, Mr O'Rourke does not disavow socialism as a creed, instead insisting "the party labels just do not matter anymore. I'm convinced of it. It's not Republican or Democrat. It's Texan and American and that's what we're standing for in this campaign". "Investing in the ability for everyone to be well enough to live to their full potential," does not need a label, he says, adding "it's also the most fiscally conservative thing possible". Cruz repeatedly challenged O'Rourke on his left-of-center positions at their first debate as out of step with Texans, hitting him on supporting gun control—the pro-gun control O'Rourke claimed he is a supporter of the Second Amendment—single-payer health care, and his views on immigration reform, drugs and criminal justice reform. Cruz labeled O'Rourke a "socialist" at the end of the debate when both men were told to praise each other. Cruz's backhanded compliment about his opponent's passion for left-wing views led O'Rourke to quip, "True to form." 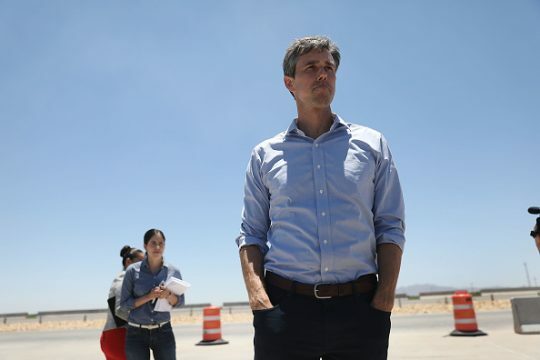 O'Rourke has electrified national Democrats with large rally crowds and viral videos, like one of his speech supporting NFL players' right to protest during the national anthem. Polls have generally shown Cruz leading, but by single digits, with a little more than a month before Election Day. This entry was posted in Politics and tagged 2018 Election, Beto O'Rourke, Ted Cruz, Texas. Bookmark the permalink.